The 1%, which is the moniker for the uber wealthy whom have allegedly stolen their lot from the 99%, has received extreme criticism in the past couple years. The Occupy Wall Street protests brought this socioeconomic class into mainstream scrutiny. Granted there are some real crooks that fit into this group, but lets not throw the baby out with the bath water. Not until we provide a little food for thought from the devil’s advocate. We would all agree that if Sam Walton were alive today he would be considered in the 1%. You may not be a huge fan of Walmart, but you have to hand it to ole’ Sam he sure created an exceptional business model. Let’s look at how Sam changed many people’s lives for the better. Currently, Walmart has nearly 1.4 Million employees, heck some of them are even millionaires. That is a lot of people who now have the opportunity to provide for themselves and their families. These Walmart employees are productive members of society, earning a paycheck to use at their discretion. By earning a paycheck (however minimal it can be) they are assisting in growing the economy. Even a $7 an hour Walmart employee goes out to dinner, buys new clothes, goes to the movies, and even buys a car. This is all helping to grow the U.S. Economy. By them spending their money in the U.S. Economy, Walmart employees are contributing to the restaurant that needs to hire more waiters and cooks, to the movie theater who needs more ushers and clerks selling tickets, and on and on. Imagine how many individuals who have invented a product that are now able to use Walmart to leverage their sales, ever heard of the Snuggie? So before we beat up on the 1%, lets look below the surface which the media and groups like Occupy Wall Street don’t want us to see. Each do well when someone is defined a villian. Ever consider what the alternative would be if their weren’t CEO’s making boatloads of cash by having employees producing products or services on their behalf? Take for instance GM, they are in large part owned by the government, which is you and I-the taxpayer. The CEO of GM is for all intents and purposes a government employee. I assure you that this CEO, by working closely with the federal government, is given a nice pay package comparable to the 1%. Here is the stark difference between the CEO of Walmart and that of GM. Walmart is a publicly traded company, who answers to its shareholders. If profits are up the shareholders benefit, if they are down, shareholders suffer. The interesting dynamic is that many pension plans, mutual funds, and other collective investment vehicles invest in Walmart. So, when occupy wall street beats up on these companies, they are essentially offending those who invest in Walmart, and that my friend, is a vast amount of people. Back to our GM CEO who is merely a government employee. Having the taxpayers unknowingly fund your battery operated cars, your union retirement benefits, is not something Sam Walton would have gotten away with, because he has to face those shareholders, whose retirement may depend on how Walmart does. 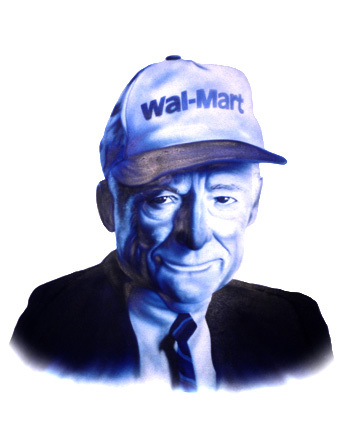 Lastly, Sam Walton does not have the force of the federal government to “persuade” you to buy their products. Keep in mind, it is not out of the question that if GM needed to sell cars, they have “incentives” to get you to buy them. Remember the government has agencies to enforce behavior, such as the IRS for example, something that Sam Walton never did. So when you hear the media and Occupy Wall Street beating the 1% drum, keep in mind there is another side to the story.